Want to see the latest client design project I’m working on? 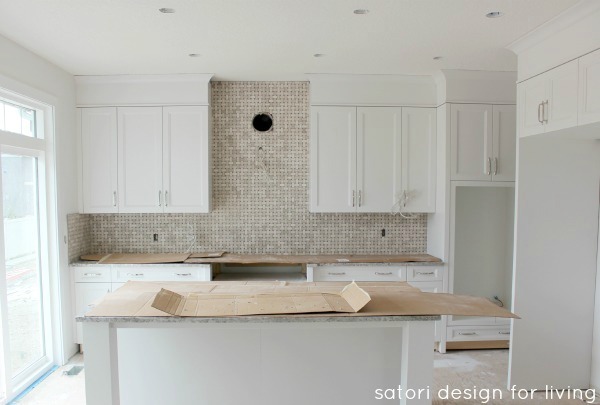 I’m sharing update photos, details and plans for the kitchen, dining room and living room in this new construction home. Hello, all. First, I want to express my deepest appreciation for all the love and support I received from you regarding our dog Reegan. The days are getting a little easier bit by bit, and I’m glad to finally be able to collect my thoughts. As mentioned last week, I’m currently involved in some amazing decorating and design projects. I thought I’d share a few update photos of one in particular. This new home build has been under construction for several months. I’ve been working closely with my clients to provide lighting suggestions, furniture space plans, as well as many of the decorating details. Possession is slated for mid-July when the hands-on work of furnishing and decorating the home will begin. 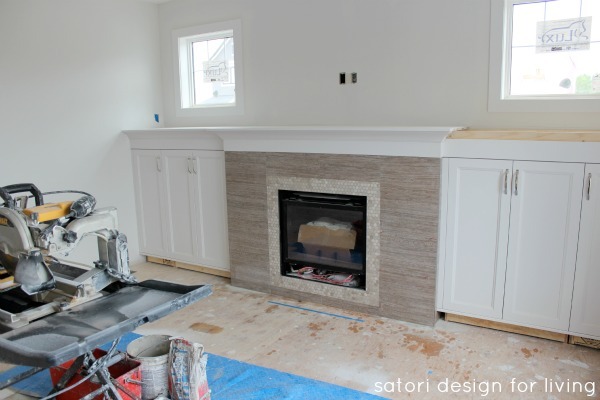 Today, I’m sharing photos and a few details of the kitchen, dining room, and living room which are all located along the backside of the house. 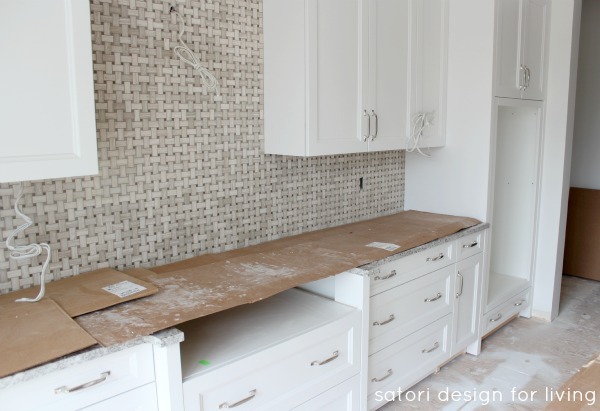 The white kitchen, with chrome hardware and basketweave marble backsplash, is almost complete. 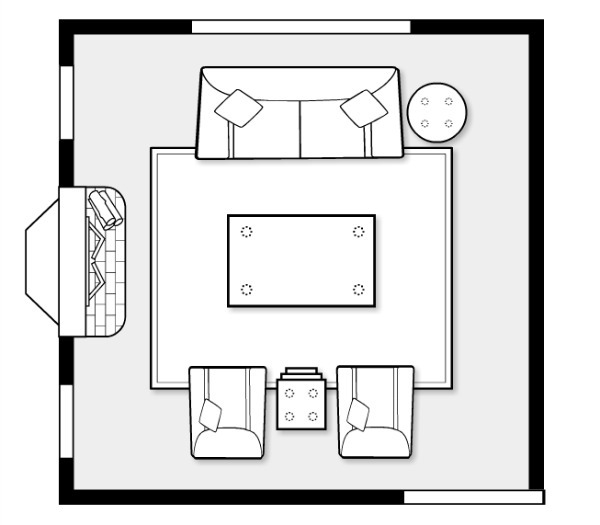 We plan on adding 2 or 3 counter stools at the island that coordinate with the living room and dining room fabrics. The dining room, which is located between the kitchen and living room, has a built-in buffet that will house a beverage fridge. The furniture space plan includes a large rustic trestle table, upholstered side chairs, a bench, and chairs with a side profile for the ends. The plan is to be able to pull the end chairs into the living room when extra seating is required. 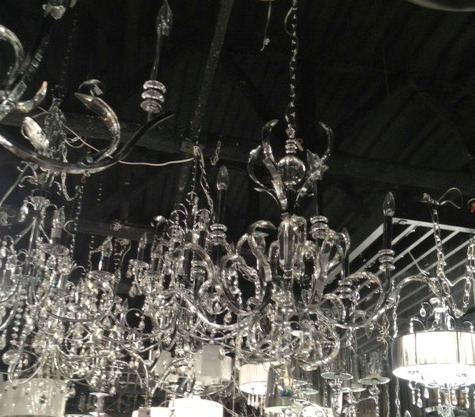 The table will have a gorgeous glass chandelier above to keep the site line fairly open from the kitchen to the living room. I wrote a post about selecting light fixtures for open concept spaces if you have a similar layout and need some tips. 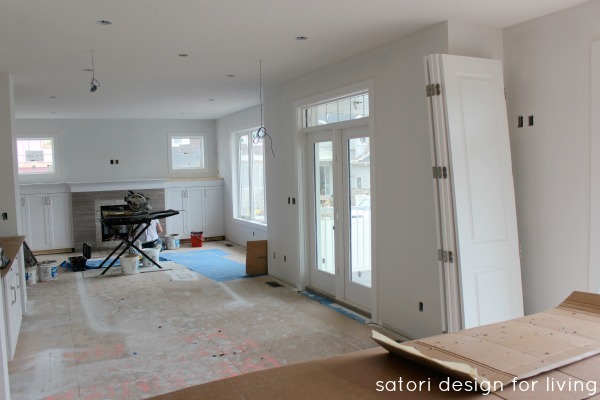 Looking from the kitchen, you can see the location of the dining area and the living room at the end. The living room has the same built-in style as the kitchen and dining room, as well as a marble fireplace surround similar in feel to the kitchen backsplash. A white mantel and marble fireplace surround is such a classic look. We kept the furniture space plan open so the fireplace view isn’t blocked. 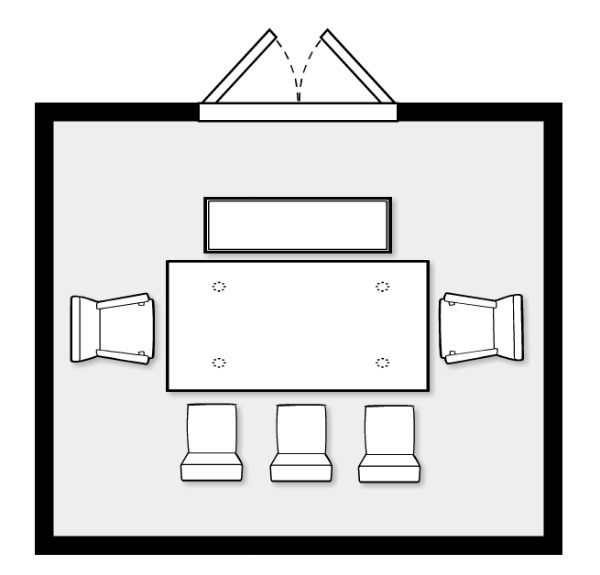 It’s a flexible arrangement that works well for small groups or larger gatherings (with the option to move the larger dining chairs in). The next step in the design and decorating process is finalizing furniture selections and placing orders. Then we will be able to focus on the smaller details, such as drapery, pillows, and decorative accessories. Have a design project of your own that you’re currently working on? What part of the process do you find the most challenging? Just lovely! I am so sorry to hear about your dog! I put one of ours down in Jan and it has been sad, but we are healing and moving on! How did I miss the post about your dog? I am sooo sorry. Our beloved lab is getting really old, we cherish every moment with have because we know our days with him are numbered. Dogs are such amazing animals, love how they are such a part of the family! 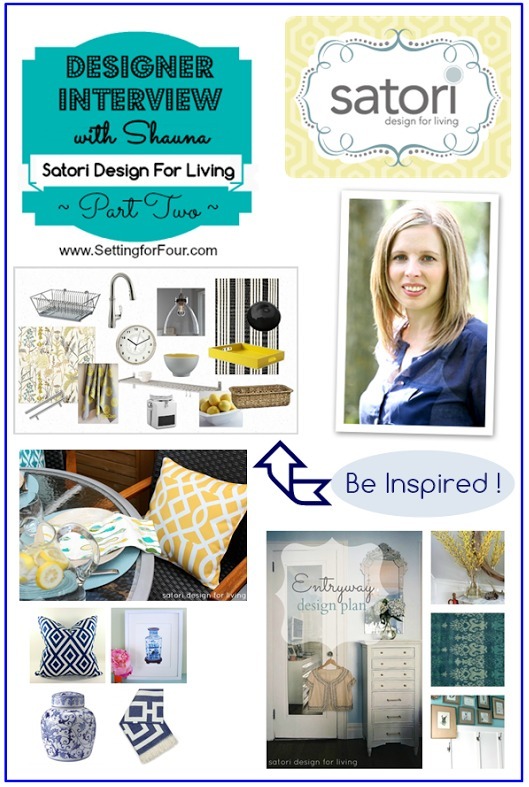 Love the home you are working on! It’s difficult when they are ailing. We find ourselves thinking back to the way she used to be when she ran all over the place and had a happy-go-lucky personality. Towards the end she got grumpy and whiny, and I can’t blame her. Not looking forward to that part of getting old. Enjoy your little man as long as possible, and you’ll know when it’s time to say goodbye. It looks like it will be beautiful Shauna! So sorry about your dog…..our yorkie is almost a year old and I can’t imagine what you must be going through right now! Big hugs. Now back to this blog post: I am absolutely loving how the kitchen & family room are turning out….so white & crisp so far. Can’t wait to see more photos as your client project evolves. 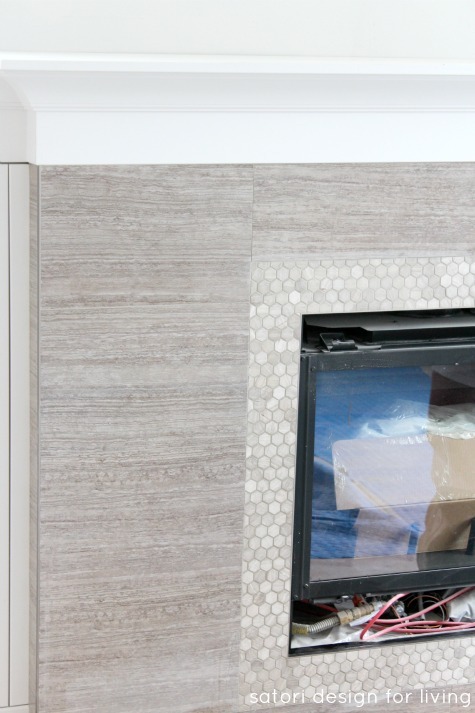 Oh Shauna I just LOVE that herringbone tile and the fireplace tile – gorgeous!! It’s going to look beautiful in there I’m sure! 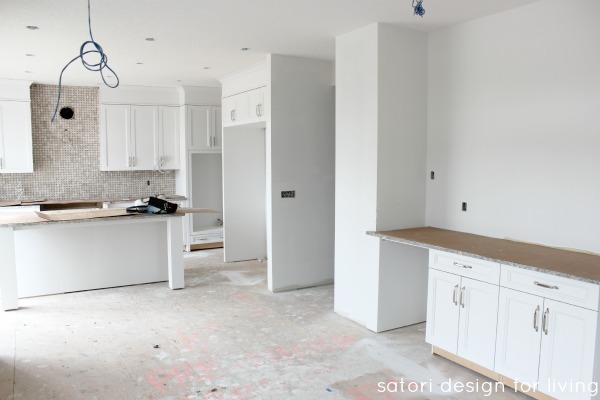 What I beautiful space – can’t wait to see what it will look like decorated! Love the basket weave on the wall! And, I’m drooling on all of those built-ins. Things are coming together so beautifully! This is looking great! THAT TILE! That basket weave tile…seriously, it’s amazing. IT’s going to be one beautiful house when it’s finished!